Soft, smooth and melt in the mouth.. this is what is roomali roti. Basically the name of the dish is adapted from a "roomal" i.e. a handkerchief.. because it is just so soft, and so big and thin that it just disappears quick; and goes well with any main course dish. I served it with Chicken Achaari and Kashmiri Pulao. 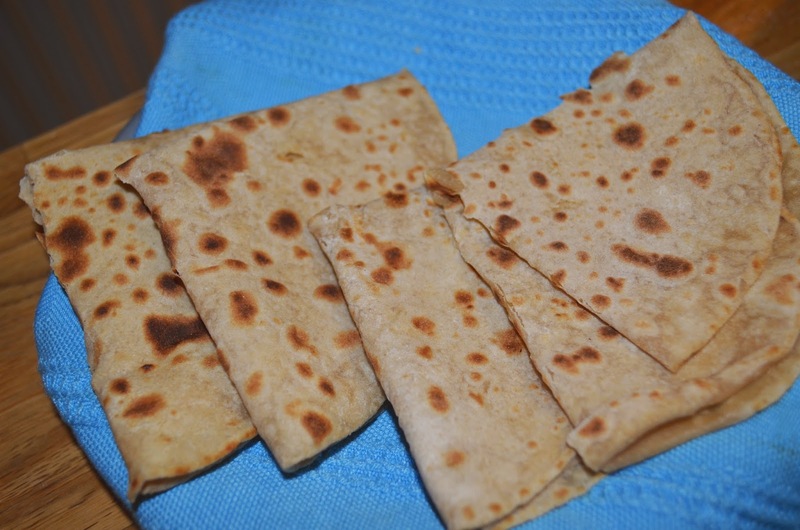 Originally it is made of all purpose flour (maida) and is cooked in an oven. But I cooked it on the stove-top with the regular what flour, hence a little difference in the texture.. Tasted wonderful nonetheless. Make a soft pliable dough using warm water. The dough must not be hard, and it should not be runny. It should be just right consistency, so add water carefully. Cover and let sit for 5 minutes. Then add a few drops of oil and knead the dough again. It will start to become soft. Cover and keep for 5 minutes again. Re-knead the dough a total of 3 times, letting it sit for 5 minutes after each time you knead. It will start to get softer and softer. After kneading the third time, pinch little balls from the dough. We'll work on two balls at a time, which will make 2 roomali rotis at once. Using all purpose flour for dusting, roll one of the ball into a very thin roti. Take care not to break it. Keep aside. Now do the same for the second ball. Brush with oil and dust lightly with all purpose flour. Keep the first roti on the top of it and roll again. Carefully lift and put it to a very hot tawa/pan on the highest heat. Quickly turn it and cook from the other side as well. Remove from heat and very carefully separate both the rotis. Repeat for all the dough. Serve these soft, melt-in the mouth rotis with any main course.